I have a motorcycle buying problem | LegNeato! Hello planet! Firefox trunk nightly on Mac OS X not staying set as default browser? 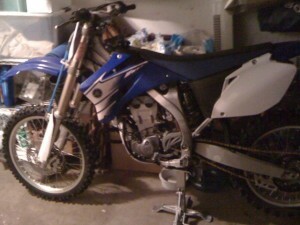 One of my hobbies is motorcycle/dirtbike riding. I was introduced to it at an early age as most of my family rides. Recently I’ve been buying and selling bikes just as much as actually riding them. The way I see it there are way too many brands and types of bikes to pick one. Plus, how do you know you’ve found the perfect bike unless you tried most of them? I was randomly flipping through the pictures on my computer, saw a bunch of dirtbikes, and decided I’d chronicle my motorcycle ownership so far. So, in chronological order, oldest to most recent…. It was time to upgrade to something newer so I sold the KTM and bought a WR250f. It was a steal, super clean, and had an electric start! Unfortunately, it was a red sticker bike. I had never experienced the red/green sticker divide (mainly because I had old bikes that were grandfathered in to green stickers). When I rode this bike I quickly realized I hated the squishy suspension. The suspension plus the red sticker finally made me get rid of it. 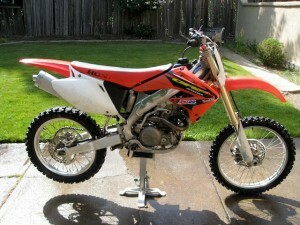 While trying to sell the WR, I came across an extremely cheap CRF450R. These bikes were going for $4000 and the one I found was selling for $1200 (if I remember correctly). I guess it was so cheap because a) it was beat to hell and b) it had a cracked engine case (whoops!). I bought it anyway. 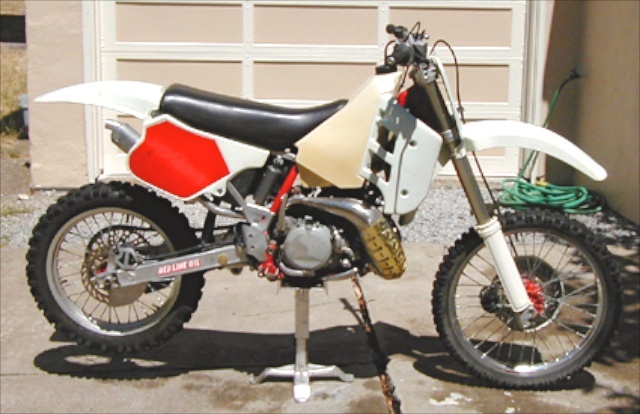 I took the CRF out once, hated it, hated how much work it would take to make it cherry, and sold it to some guy at a profit. I made a point to show him the engine case crack (JB weld to the rescue) and pointed out it had a flat tire. I didn’t want to take advantage of anyone. He bought it anyway. 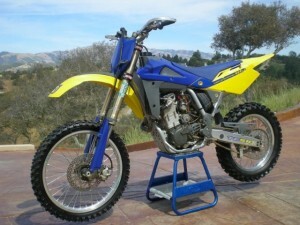 Next I bought a Husqvarna TE510. This bike was extremely clean as well. I got an amazing deal and was excited to have a green sticker, electric start bike! I kept the bike for a year or two until I decided I wanted something a little different. If the bike had been one year newer it would have been street legal. It was frustrating that I couldn’t ride it on the street–the only difference between 2005 and 2006 was the color of the plastic. Well, that and in 2006 Husqvarna took the time to do the paperwork to certify it for the street. Around the time I bought the husky I found my TM300 for sale. These bikes are extremely powerful and extremely rare. I found one for sale near my parent’s house that was very undervalued. My original intention was to flip it, but I loved it so much I kept it. I get tons of looks when I ride this bike, as they have a mythical quality about them (and have no US distributor). I’m currently looking to sell it as I am worried about getting parts here in the US if something breaks. Next I bought a KLX300. 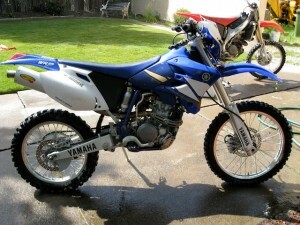 For some reason I always wanted to own a KLX. The KLX was a hot bike at one time, probably when I was growing up and reading all the dirtbike magazines. Unfortunately, by the time I actually owned one the bike was extremely outdated. I thought I could let my sister or cousins ride the bike, but it was way too heavy and had trouble starting. 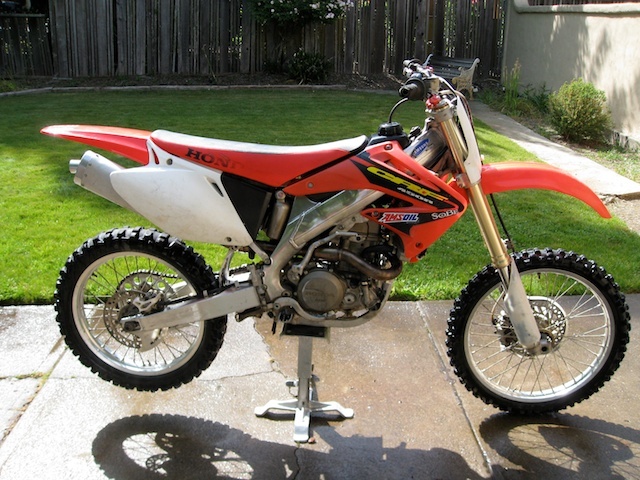 I got it for under market value and it came with almost a 2nd bike in parts so I wasn’t worried about losing money. I ended up selling the bike and the parts bike for a lot more than I paid. I never even took the bike out. The bike was hard enough to start in my garage let alone on a hill, which made me not want to risk it. Next I found another undervalued bike. This time it was a 2002 CR250. This model bike is special for a couple of reasons. First, it is the last year of the green stickers. Second, the frame was all new in 2002 and Honda didn’t change it for 5 years. Third, Honda’s are known for their reliability. Because of these reasons, this particular model is highly sought after. It is the most modern green sticker 2 stroke you can buy. I was browsing craigslist one day and came across a clean one for 1/2 what they normally cost. I called the guy 20 minutes after he posted it and he had already had 3 calls. I was working from home that day so I picked it up right away. Three people called about the bike while I was there loading it up. I couldn’t decide if I was keeping it or flipping it, but I later came across a guy on craigslist wanting to trade his 2007 YZ450f for the bike. I figured it was a great deal, met with him, and traded straight up. 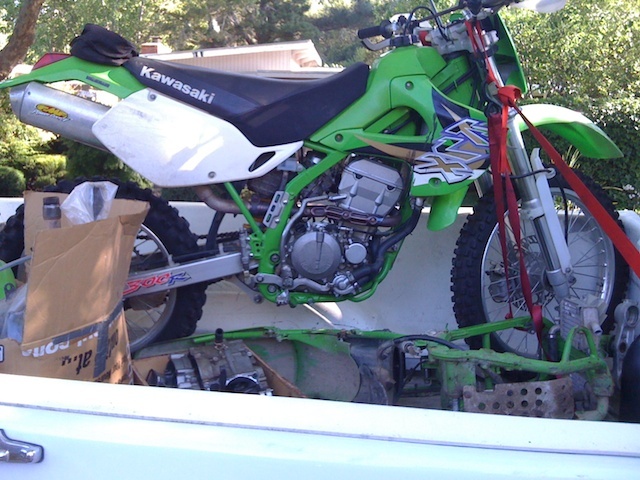 I was pretty stoked–I now had a bike that was both newer and had a bigger engine. 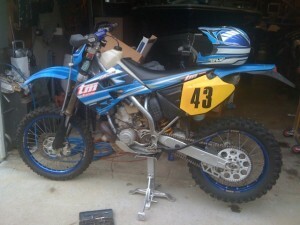 I then came across a guy who wanted to trade his Aprilia for a modern YZ450f, so I had to do it. 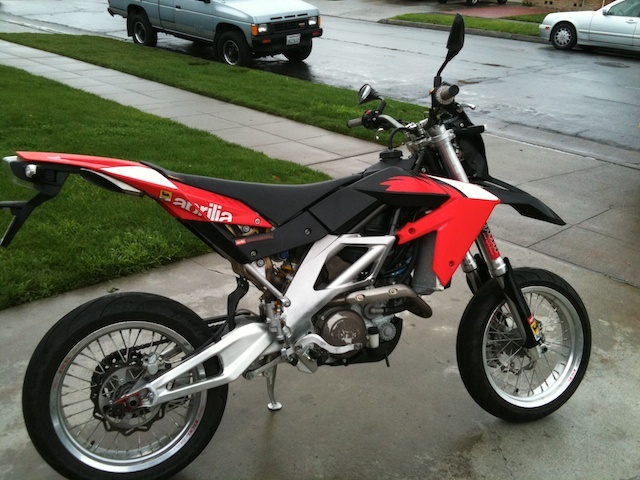 I traded a red sticker run-of-the-mill Japanese dirtbike for a street legal exotic Italian dirtbike. The bike has supermoto rims for the street and dirtbike rims for the dirt. It’s a fuel injected v-twin, which is unheard of for a dirtbike. I don’t think I will be getting rid of it any time soon. So, what next? 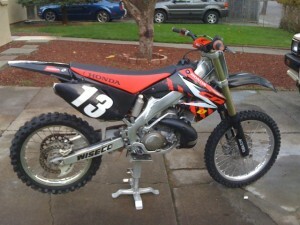 I’m trying to get a KTM300 and am keeping my eye on craigslist for any good deals. If I find something I want I will likely sell my TM…having 3 dirtbikes is just too much! Wow, crazy that a majority of those were all in the last three years. The Aprilia is definitely the looker of the bunch. Awesome, I’ll have to take you up on that! Do you visit the MV office a fair amount?